watching this movie right now, on MGM HD channel. WITHOUT WARNING (1980). it's about little flying saucer-like aliens, slurping up humans. Yeah, it's like a zero-budget "Predator." It has a great cast of hard-drinkin' kind of guys hamming it up...Cameron Mitchell, Neville Brand, Jack Palance, and Martin Landau. And it's what I think can charitably be called "mindless AIP exploitation gutter trash." That said, it's pretty fun. Called 'The Warning' in the UK. One of the first horrors I ever saw on video - scared me sh!tless. Didn't help that it was low budget and weird. I agree with Logan that the low budget part of this movie actually made it creepy. Not a great movie that felt like it might have been made in the late 60's rather than closer to the 80's. Oh and kind of like the shock of finding David Caruso when you watch "First Blood" for the first time since the 80's.. this flick is even earlier in his career. This looks a little too freaky for me. are rare and pricey when you happen to bump into one. you know, the only reason i stopped to watch this movie, was because someone here had mentioned robby benson in another topic, and while flipping through channels, i thought the guy in the picture above was him! it was cool to see this, since i had not even heard of it before. i liked it. it had a few squeamish scenes but that's what was good about it! it was a little hokey at times, but it was made in 1980. It seems that Without Warning will get a scandi dvd release during summer 2011.
i have this on a old uk vhs tape ,but the person who sold it to me must have stored it somewhere damp as the tape reel is covered in mold,managed to watch it all the way through, even though the picture did keep breaking up.fun little movie. mgm hd show a varied collection of 80s movie,i see they had burt reynolds malone (1987) on the other night ,then ghoulies (1985),later in the week poltergeist 2 (1986) and siege at firebase gloria(1989). Finally watched Without Warning and i have to say that it was not as good as i thought it would be. It´s a slow moving low-budget film with lots of pointless wandering and silly behaviour. There is however few nice/suprising scenes and atmospheric moments and it´s fun to see all those old timers like Palance, Landau, Mitchell and Brand here. The Rick Baker/Kevin Peter Hall alien looked ok and i liked those things it throws, wicked little creatures. Guess i should´ve seen this back in the mid 80s (actually saw snippets) so it would feel at least a bit nostalgic. 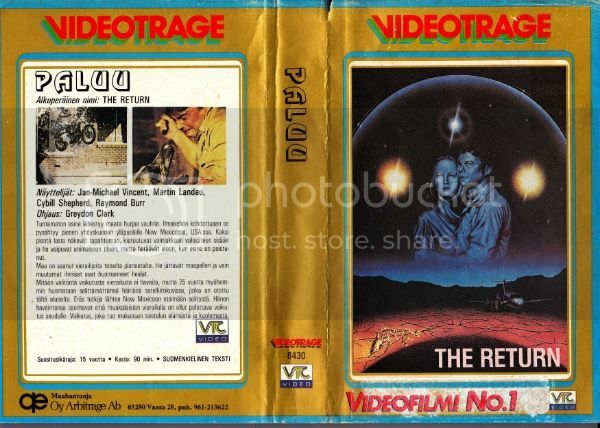 I recommend another 1980 Greydon Clark movie The Return which i found much more entertaining. Never heard of "Without Warning" before! Thanks for making us aware of this. I'll have to check it out - I like low-budget horror sci-fi, and the fact that this was released in 1980 (even though it was probably all filmed in the late '70's) is even better. It looks like this is out on DVD & Blu-ray. You'll get a kick out of Without Warning. While released in 1980 just a couple of months after DePalma's Dressed to Kill (!) by Filmways, the reconstituted AIP, it has the feel of a 50s or 60s sci-fi film. Just saw "Without Warning" - great low-budget/cheesy film, with many unintentionally funny scenes. The film had elements of '80's slasher films, "Invasion of the Body Snatchers", the 1960's Twilight Zone series, and "Alien". It was interesting to see Martin Landau & Jack Palance star in such a low-budget sci-fi film. It was also kind of funny to see a pre-NYPD David Caruso star as one of the college kids. Without Warning is a lot of fun. I always recommend it to folks wanting to see some Grade Z horror/sci-fi. It's one of Greydon Clark's most entertaining films, with a cast of drunks.